The question isn’t really where the beef is. What you should be asking about is the veal belly. And the duck. 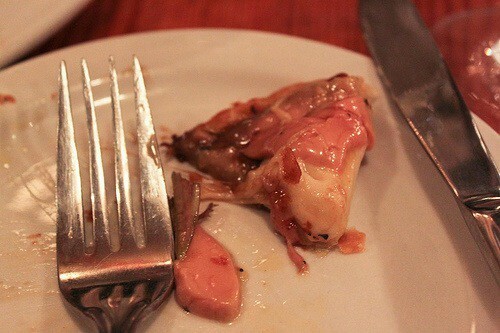 And especially the foie gras. And where are all of these meats? They’re in Montreal. 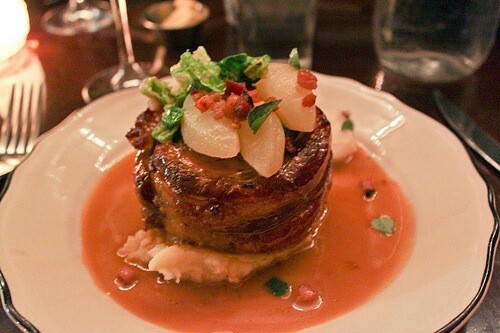 Au Pied de Cochon (536 Duluth Est; 514-281-1114) is the tougher seat to get—even the barstools are spoken for, leaving no place to grab a pint of the house cider before your table opens up. 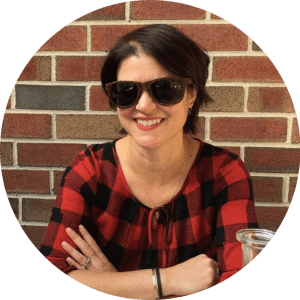 A hostess whose grip on the reservations list is as intimidating as the eels floating gape-mouthed and languid in a tank at the entrance has no qualms with kicking out interlopers. A successful run of the entrance gauntlet rewards diners with a sliver of space in a bustling and bright room, and a menu featuring an entire section dedicated to foie. A round of cured foie gras tart, slathered with garlic- and cheese curd-infused mashed potatoes is one of those dishes that causes involuntary noises of pleasure. Though the entire tart is the size of a Pizza Hut personal pan pizza, its over-the-top creamy savoriness should be split with someone appreciative to avoid any fatty luxury overdose. 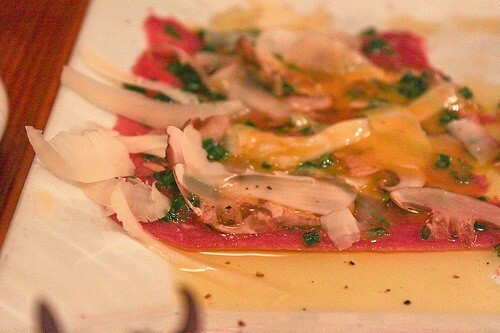 Duck carpaccio, intended to be light and refreshing, seduced me into fullness with its velvety truffled slices. My inflated belly dashed any plans for a Happy Pork Chop (which, judging by the size of those that wandered by, might have been carved from a refugee pig from The Flintstones) or an attempt at the foie gras poutine. For dessert, I wheedled one of the line cooks into selling me a jar of just-made apple jelly for the road, promising that I wouldn’t dig in for another week until the jar had fully gelled. Having cracked it open after the appointed waiting period, I can report it would be divine with a lobe at home, if only I had the budget for one. Anyone who spends a fair amount of time at any of the restaurants in the Frankie’s dynasty might not even feel the need to hit up Joe Beef (2491 Notre Dame Ouest; 514-935-6504). With the studied down-home decor that’s apparently international visual shorthand for farm-to-table, the restaurant feels unnervingly like a little bit of Brooklyn in Montreal with bearded, plaid-clad servers bearing no trace of French accents rushing around the cramped dining room. Despite a much friendlier welcome than APDC, the Joe Beef menu process felt rushed: before getting straitjacketed into a banquette, one must stand in the middle of the tiny dining room, edging out of the servers’ way while trying to memorize a lengthy (always-changing) menu and equally overwhelming wine list. No turning back once you see something interesting, unless you want to force your seatmate or server to repeat the entire thing to you. The menu features moments of brilliance: a slow-braised veal belly with potatoes and cabbage that’s a taste distillation of fall comfort, the barely seared mushrooms drenched in a foie gras reduction that accompanied my quail. (The signature Joe Beef dish, a Double Down made with deep-fried lobes of foie gras sandwiching bacon, Cheddar, and Sriracha mayonnaise, remains a question mark, as I’d have to cash in my meal card for the next three days if I wolfed that thing down). But the transcendent elements come at a high price, and all the housemade bologna in the world can’t make up for a lackluster fried egg and dry, flavorless truffle shavings. It’s restaurant roulette; decide what you’re willing to pay to potentially strike gold, and whether it’s worth forcing strangers to rearrange their wine glasses just so you can go visit the enormous taxidermied buffalo bust in the bathroom. 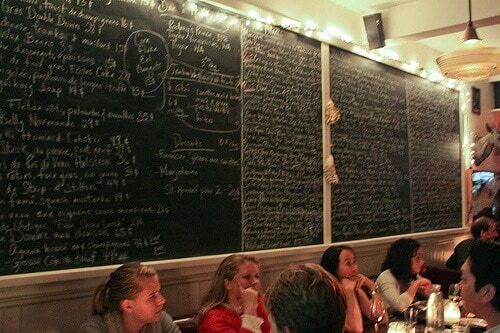 If I only had one night in Montreal, I’d make a return visit to Au Pied de Cochon, triple-checking to make sure my reservation was still on the books before arriving. If I had another week and warmer weather, I’d pick at one or two more Joe Beef dishes in the backyard garden. No matter which you choose at either restaurant, however, order less than you think you can eat; the richness will suffice.